All invasive plants are weeds but not all weeds are invasive. In fact, a great majority of weeds aren’t invasive. Most are native plants that respond to natural and human-made disasters by covering and protecting exposed soil. They do not invade native vegetation by spreading among the longer-lived, shade-casting plants that make up what we call climax vegetation. Here are illustrations of the 153 weed species observed or expected to appear at Coldwater Farm. Click images to see weed names and image creators. If there is no name or creator given, or if you want information on a weed’s characteristics including its value as medicine and food, refer to the bookWeeds of Dewey-Humboldt, Arizona available from Amazon,and Gifts and Games in Humboldt. Plant identification is easier with drawings made by an experienced botanical illustrator than with photographs. In photographs, important features aren’t always distinct on a particular leaf or flower. An illustrator can emphasize the appropriate features. Photographs are useful for showing plant colors and typical settings with other plants. For each weed, I tried to present the best illustrations available. Many of the drawings are by Lucretia Breazeale Hamilton from the book An Illustrated Guide to Arizona Weeds by Kittie Parker published in 1972. In the gallery, they are usually identified as “Parker”. They are included with the generous permission of the University of Arizona Press. Most of the photographs have Creative-Commons licenses that allow reproduction only requiring attribution to the photographer (CC BY 2-4 and BY-SA 2-4). I did not alter the photographs except as needed to fit them on the page and make them suitable for printing. Some of the drawings and photographs are from U. S. government web sites and are in the public domain. Paintings were available for some of the weeds. The ones I used are over 100 years old and are in the public domain. For all images, Weeds of Dewey-Humboldt, Arizona has the names of creators in the captions and in an Index of Illustrators, Painters, and Photographers just before the General Index. You can find more works by the photographers by entering their names or the names of the plants they depicted in the search box at Wikimedia Commons, Wikipedia, or Flickr Creative Commons. “GR” in a caption identifies photos by me. You can use my photos as long as you attribute them as “© Garry Rogers.” Look up Creative Commons BY-SA 4.0 to read the license requirements. Walter Hood Fitch – Illustrations of the British Flora (1924) – Permission granted to use under GFDL by Kurt Stueber. Source: http://www.biolib.de – Permission is granted to copy, distribute and/or modify this image under the terms of the GNU Free Documentation License, Version 1.3 or any later version published by the Free Software Foundation; with no Invariant Sections, no Front-Cover Texts, and no Back-Cover Texts. A copy of the license is included in the section entitled “GNU Free Documentation License”. Jacob Sturm, Johann Georg Sturm -Deutschlands Flora in Abbildungen (1796). Source: http://www.biolib.de – The copyright of this image has expired. The flowering head or spikes are distinctive in bearing widely diverging spikelets separated by short internodes. Abbé H. Coste – Flore de la France (1937). Source: http://www.tela-botanica.org/ – This image is in public domain because its copyright has expired. Otto Wilhelm Thomé: Flora von Deutschland, Österreich und der Schweiz (1885) – Permission granted to use under GFDL by Kurt Stueber. Source: http://www.biolib.de Permission is granted to copy, distribute and/or modify this image under the terms of the GNU Free Documentation License, Version 1.3 or any later version published by the Free Software Foundation; with no Invariant Sections, no Front-Cover Texts, and no Back-Cover Texts. A copy of the license is included in the section entitled “GNU Free Documentation License”. The light colored fruits have a cap that falls off to release the enclosed dark seed. 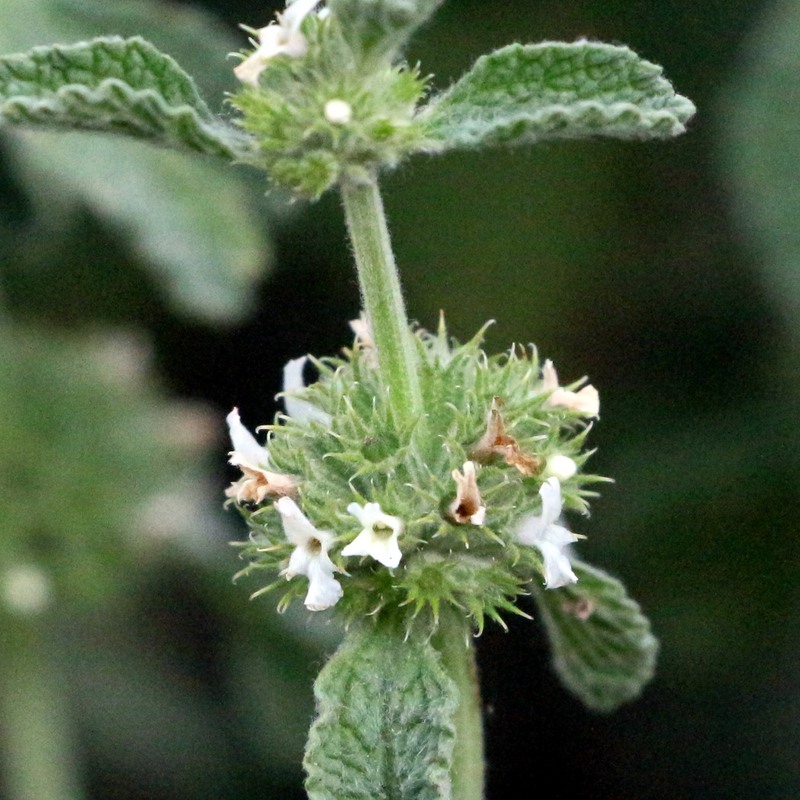 The flower bracts are spine-tipped and the sepals are thin small membranes with rounded to blunt tips. The black fruits protruding through the old flowers are seen by August. The flowering heads comprise only ray flowers. USDA-NRCS PLANTS Database / Britton, N.L., and A. Brown. 1913. Illustrated flora of the northern states and Canada. Vol. 3: 558. This arbitrarily assigned enemy of the state produces a spectacular bloom of purplish flowering heads that are each delimited by an array of ornate bracts. Oops, this is Japanese Bristlegrass (Setaria faberi), not Green Foxtail)–GR. Posted in Invasive Species, Weeds	| Tagged Human Impact, Invasive Species	| Enter your password to view comments. 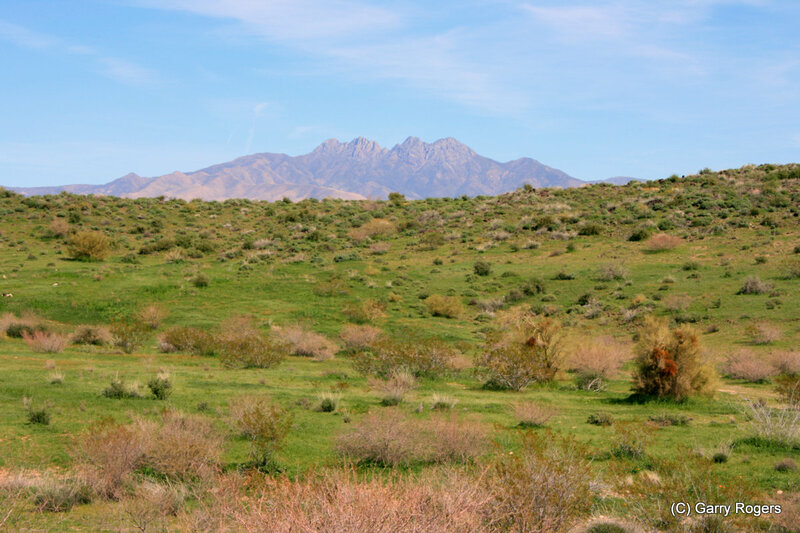 This is the first in a series of articles on methods for preventing the devastation caused by weeds invading desert ecosystems. Weed managers can build periodic reviews into their plans so they can benefit from results and insights generated by the plan’s implementation. Adaptive management, also known as ecological management, uses analytical techniques to assess results of actions and provide feedback for improving methods. Adaptive management is useful when outcomes are uncertain but weed treatments are clearly defined. Analysis of outcomes may contribute new general knowledge, and it will help adjust policies and tactics. Building a list of problem weeds for management units is an essential part of weed-control planning. Private and government organizations provide lists of known invasive species for countries and regions worldwide. These sources will provide a baseline list that will expand as observations and experience accumulate. The place to begin is the Invasive Species Compendium hosted by the Center for Agriculture and Biosciences International. The field of Weed Science developed in response to the measurable economic costs of weed invasions of farms. Measuring economic costs of weed invasions on non-agricultural wildlands is more difficult. Aldo Leopold argued that applying economics to ecosystems was not appropriate. “One basic weakness in a conservation system based wholly on economic motives is that most members of the land community have no economic value. Wildflowers and songbirds are examples. Of the 22,000 higher plants and animals native to Wisconsin, it is doubtful whether more than five percent can be sold, fed, eaten, or otherwise put to economic use. Yet these creatures are members of the biotic community, and if (as I believe) its stability depends on its integrity, they are entitled to continuance” –Leopold, 1949, 210. During the years since Leopold wrote the above comment, environmental economics has made substantial progress. For instance, weed reductions in species richness and diversity and harvests of wildland plants have been measured (e.g., Costanza, R., d’Arge, R., de Groot, R. et al., 1997), and benefit-cost analysis supports stringent weed control strategies (Naylor, R. L., 2000). As weed management has progressed toward integrating complex tactics and ecosystem concepts, the issues may have become opaque to nonscientists. Conducting weed-management discussions within a framework of human economic and environmental security can awaken public interest. An effective strategy for encouraging public support is to provide examples that involve local communities. Field trips to view fire scars or transmission corridors dominated by weeds will illustrate how weeds are transforming desert vegetation. Community leaders can use the illustrations to create weed prevention and eradication programs within their community. No one wants to lose the value and character of the land, but many users of the land are unaware of the full significance of the weed invasion. Weed managers can find partners willing to help publicize weed problems among organizations, such as native plant societies and wildlife conservation organizations. Weed problems will also interest recreation users, ranchers, hunters, and others spending time outdoors. School visits, field demonstrations, films, and tours for individuals and groups of users should be an initial element in weed control plans. 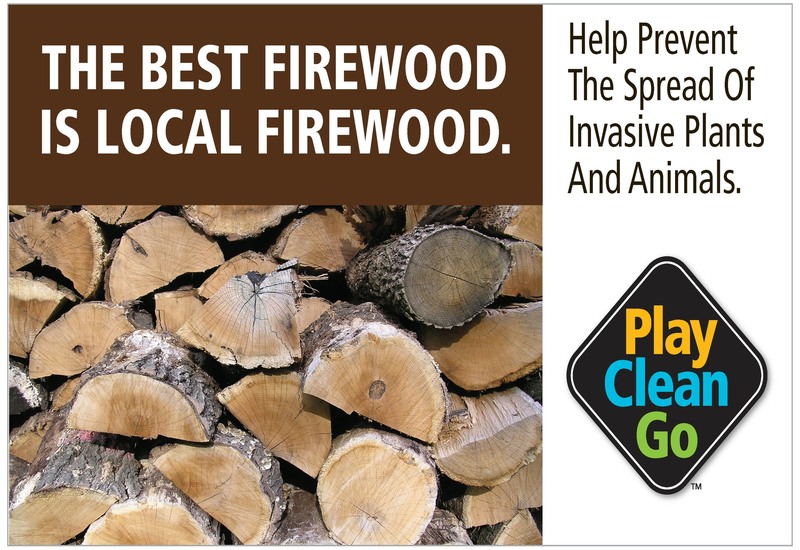 Education materials are available online from the North American Invasive Species Management Association. National and regional restrictions can limit introduction of invasive plants. Regulation is most effective if there is public awareness and participation. 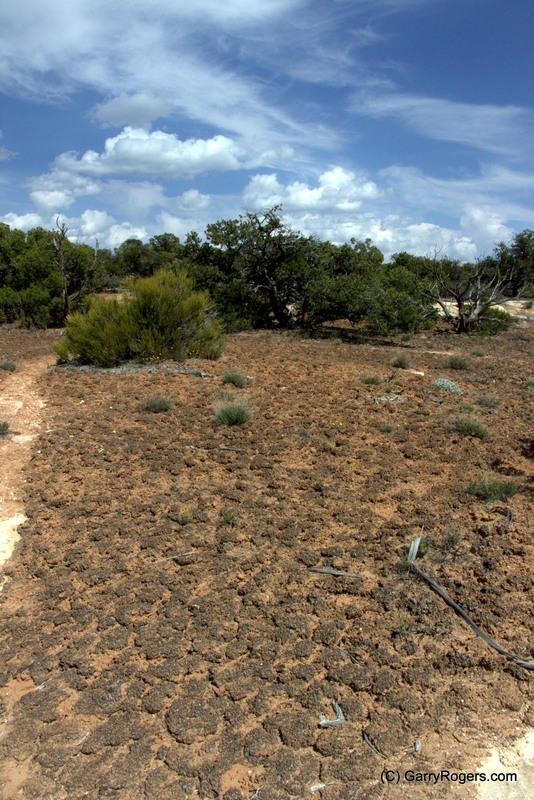 Biological soil crusts block invasive weeds in deserts. Livestock grazing damages crusts and heavy trampling can eliminate them. (Collema spp. In Colorado Plateau division of the Great Basin Desert. © GR. Supporting and restoring native plant communities and ecosystems increases resistance to invasion while reestablishing lost biodiversity and ecosystem value (Blumenthal, D. M., Jordan, N. R. & Svenson, E. L., 2003). Habitats and ecological processes can suffer cumulative impacts from the direct and indirect effects of invasive species. 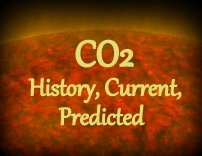 Ecological relationships that have evolved over evolutionary timescales are at risk. Invasive species cause disturbances that have multiple effects throughout an ecosystem, and human alterations of the environment can exacerbate them. Healing these disturbances is difficult. Thus, restoration treatments are an integral part of control and management efforts. They help guard against future re-infestations and the potential for further harm. Strict fire-control programs and grazing management to allow recovery of soil microorganisms and native vegetation removed by fires or excessive grazing are essential. Healthy native vegetation resists weed invasions. The Society for Ecological Restoration supplies information with examples and techniques on the organization’s website. Effective weed control requires rapid responses to invasive weeds. Early detection is essential. It requires preliminary inventories and regular monitoring to discover new populations. The later section on inventory describes monitoring tactics. Management responses including mechanical, chemical, biological (including grazing), and fire treatments are described in the section on treatment tactics. The appearance of a non-native species does not always signal the onset of an invasion. Unfavorable environmental conditions, inherent demographic and biological limits, and resistance of native vegetation can prevent spread or cause demise of a weed. Because of the uncertain survival of new weeds, the first response to most species should be monitoring. This does not apply to weed species known to be invasive in similar sites nearby. Since it is possible for a static weed patch to serve as a source population, monitoring must include a thorough survey of the surrounding area. Repeated observations of existing populations is ‘type-two’ monitoring in the discussion below. Monitoring comprises repeated observations to detect new weed infestations, to keep track of changes in an existing weed patch, and to test the results of management activities. When effort is evenly divided between monitoring and treatment, weed control becomes more efficient. I recognize three types of monitoring. Type-one comprises repeated searches of sites for new infestations, type-two comprises repeated observations of existing infestations, and type-three comprises repeated observations to learn the results of management actions. Periodic visits to likely sites for new infestations are the primary defense against new weed invasions. Variations in weed visibility and elevated threat levels associated with highest priority sites and weed species might require multiple visits each year, but most areas can be visited yearly or every two or three years. Because desert precipitation is often irregular, monitoring schedules must be flexible. Some weeds germinate in spring when there is sufficient moisture; and others germinate after summer rain. If the weed list for a particular management unit includes species from both groups, two visits each year are required. Single yearly visits should follow summer rains when winter annuals are still standing and summer annuals are likely to have germinated. Recommended frequencies are included in Table 1. Table 1. Decisions Based on Combined Weed Species and Site Priorities. 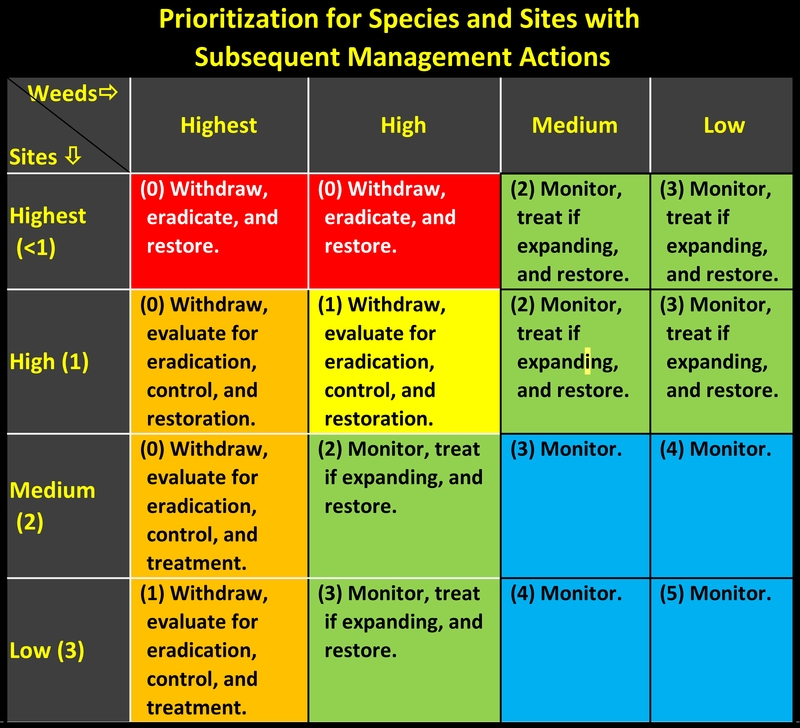 This table shows management actions for sites with varying weed threats and resource values. Managers use it to set inventory and monitoring schedules after the initial weed inventory is complete. Numbers in the left column of Table 1 are the minimum frequency in years for type-one monitoring to detect new infestations. Schedule highest-priority sites for two or more visits each year to spot species that develop differentially during spring and summer. Numbers in cells (not including the left column) are the recommended frequency in years for type-two monitoring of infestations. Zero (0) in the cells for highest and high priority sites and the weed designations “Highest” and “High” indicate that rapid response instead of monitoring is required. Highly invasive weeds are eradicated as soon as possible after discovery. Seasonal timing of type-two monitoring should match the maturation of individual weed species. Withdraw indicates intervention to limit human disturbances. The term “monitor” refers to type-two monitoring. Type-three monitoring will follow all treatments and restorations. Eradicate refers to the immediate management response for new or small areas of weeds. Eradication of widespread weeds requires a preliminary effort to secure financial and public support. Type-two monitoring applies to new and existing infestations. It is used to determine stability and potential threat. Since weeds often establish in plant communities and on soils that are not optimal for their survival and growth, many patches found along roads or around disturbed areas may never spread into adjacent vegetation. It is cost effective to monitor them while devoting resources to treating infestations of species of highest concern in high-value areas and infestations known to be spreading. Recommended frequencies are included in Table 1. Type-three monitoring gauges ecosystem responses to natural and human-caused disturbances, weed treatments, and restorations. Landuse such as livestock grazing, weed treatments, and restoration projects incorporate measurements made at regular intervals. Type-three monitoring will often occur more than once during growing seasons. Weed populations grow by expanding their boundary and by long-distance dispersal to establish outlying or satellite populations. Where habitat conditions and dispersal vectors are spatially uniform, propagule dispersal from each plant follows a simple curvilinear process to create a circular pattern with decreasing propagule density in all directions from the center. As the area of an infestation grows, the proportion of each plant’s propagules falling among the plants within the occupied area will increase and the proportion falling outside the area will decline. Thus, the rate of expansion will decrease as the infested area grows. Since the rate of expansion is greater for small populations, satellite populations should be treated first. Horehound (Marrubium vulgare) beside a fresh road cut through weed-free oak-dominated Interior Chaparral. Each plant produces thousands of hooked seed pods. Since a single plant can produce thousands of seeds, very small satellite populations of one or a few plants can serve as significant sources for further invasion. Searches in concentric circles around the source population should find fewer satellites as the circles are enlarged. Of course, neither available germination sites nor dispersal vectors such as wind vary with topography, vegetation, and transient air pressure. 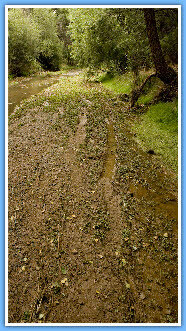 However, without preliminary data on vectors and preferred habitats, the more refined and accurate analytical techniques geographers use (e.g., R. Abler, J. S. Adams, and P. Gould, 1971) to calculate rates of spread and predict the impact of barriers (absorbing, filtering, reflecting), shapes of source areas, hospitable sites, and so forth cannot be used. Thus, the inventory system presented below assumes symmetrical dispersal and is appropriate for general use to locate satellite populations. Information about a particular species’ dispersal mechanisms and response to vectors and barriers in particular locations can be developed and used to modify the search pattern (see M. B. Soons and J. M. Bullock 2008). Property boundaries do little to influence weed dispersal and establishment. Fences may stop the first wave of tumbleweeds, and they may create rows of bird-dispersed weeds, but they are not an effective barrier. Coordinating prevention, inventory, and control with neighboring agencies and private landowners is essential. Immediate eradication is sometimes more cost effective than the various other treatment options. Annual costs to control weeds increases as new species arrive and existing species establish satellite populations. Eradication of a widespread species is difficult and costly, but might be essential to protect native ecosystems and reduce long-term costs. Mack, R. N. & Foster, S. K. (2009) found that eradication of a widespread species requires most of the following conditions. An effective prevention plan is in place. An exhaustive inventory is available. The target species are readily detectable. 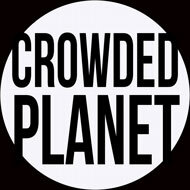 Failure to find all individuals creates opportunities for new seed banks to form. Terrain is accessible and easily inventoried and monitored. Target species’ seed bank is short lived (no more than 3 years). Target species’ current range is small enough that available resources are adequate for inventory, eradication, and monitoring. Concurrent treatment of satellite and source populations is possible. Monitoring will continue well past the expected duration of the seed bank. Otherwise, seedlings and other individuals missed in inventories, treatments, and subsequent monitoring will produce new seed banks. Public and financial support is constant. Abler, R., Adams, J. S. & Gould, P. (1971). Spatial organization: The geographer’s view of the world. Englewood Cliffs, NJ, Prentice-Hall. Blumenthal, D. M., Jordan, N. R. & Svenson, E. L. (2003). Weed control as a rationale for restoration: example of tallgrass prairie. Conservation Ecology 7, 1. Costanza, R., d’Arge, R., de Groot, R., et al (1997). The value of the world’s ecosystem services and natural capital. Nature 387, 253-260. Mack, R. N., & Foster, S. K. (2009). Eradicating plant invaders: Combining ecologically-based tactics and broad-sense strategy. In Inderjit, (ed.) Management of invasive weeds. Pp 35-60. Dordrecht: Springer. Leopold, A. 1949. A Sand County almanac and sketches here and there. New York: Oxford University Press. Naylor, R. L. (2000). The economics of alien species invasions. In Mooney, H. A. & Hobbs, R. J. (eds.) Invasive species in a changing world. Pp 241-259. Washington, D. C.: Island Press. Soons, M. B. & Bullock, J. M. ( 2008). Non-random seed abscission, long-distance wind dispersal and plant migration rates. J. Ecology 96, 581-590.